If you were lucky enough to visit Wrightsville Beach over the summer, you might have noticed a few sea turtles nests along the beach. Although sea turtles lay their eggs in underground holes, a dedicated team of sea turtle enthusiasts takes it upon themselves to mark the nests, so that beach-goers do not inadvertently damage the precious eggs under the sand. This team, known as the Wrightsville Beach Sea Turtle Project, is dedicated to the preservation of sea turtles by implementing conservation and protection measures through action, education and collaboration with others. The sea turtle season begins in May and goes throughout the summer. 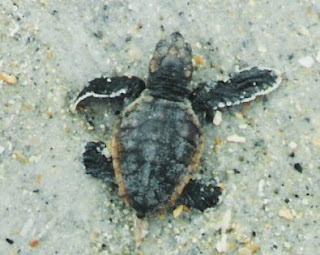 According to their website, the Wrightsville Beach Sea Turtle Project's 2011 season was a success, with a total nest count of 3 – two more than the previous year! For those interested in learning more about sea turtles, the Wrightsville Beach Sea Turtle Project offers “Turtle Talks” throughout the season. These are family-friendly, free events where guests can learn about these magnificent creatures. For those who wish to do their part to help, the Wrightsville Beach Sea Turtle Project encourages volunteering, sponsorship and donations. Visit their site at www.turtles.wrightsville-beach.info/index.htm for more information. For teens who are interested in learning about sea turtles and marine biology, Wrightsville Beach is also home to Sea Turtle Camp. Through this program, students can gain valuable experience volunteering at a sea turtle hospital in Topsail Island, explore the wetlands of the Masonboro Island Preserve and more. This enriching program can be a life-changing experience for any young person who has a passion for coastal wildlife. With such a treasure trove of natural wonders, Wrightsville Beach and its surrounding areas are truly remarkable places to call home. For information on Wrightsville Beach real estate or investment property in the area, contact Hardee Hunt and Williams at www.HardeeHuntandWilliams.com or 910-256-6998.